At one time or another we have all surrendered our “right” or our position or our opinion in order to keep the peace. Of course, there are some who are more than willing (maybe too willing) to give in. And on the other end of the spectrum there are others who act like every discussion is a hill they are willing to die on. Ever notice that some people stoke the smallest disagreement so it develops into a huge battle? These situations may be based on a small misunderstanding but one party cannot back down or have a reasonable discussion. Sometimes this happens with friends but it is particularly devastating when it happens within families. The rift in the relationship grows so large and involves so many people that it impacts generations of relationships. Some of these issues last decades and lifetimes. Often death, diagnosis, or disability comes along to remind us all how fragile and precious life really is. Life is short. Life can be really hard. Ideas and principles are important but people and relationships are even more important. There are times a tragedy can be a catalyst for healing in relationships. Don’t wait for some disaster to offer the olive branch of peace in a strained relationship. If you feel you have been wronged, let the Lord avenge it. Your interpretation of the situation or what “offended” you might, actually, be a bit off base. Feelings often lead us astray. And there are many sides to a story. We are, hopefully, changing and growing every day and learning more about ourselves and the world around us. What was worth battling about five years ago might just be a blip now, considering the circumstances. Lost time cannot be recovered but we can move forward together and in peace, making memories along the way. When I struggle to accept someone’s word it is because I have been tricked before. When my trust has been violated it makes it very difficult for the next person to get a fair shake. Even though I have trust issues for good reason, I have always been able to take God at His Word. I am thankful for that faith He planted in me through baptism and nurtured through the years. I love His work in my life even if it is difficult during the process. Looking at the betrayal of Jesus and all the other painful events of Good Friday, I can see what God has done (and is doing) for me. Right now. And He has done it for you, too! 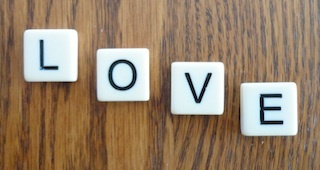 It is unfortunate that we use the word love so casually in the English language. In the context of Scripture love takes on a much different intensity. When encountering the inevitable challenges of life, it is only in the strength of the Holy Spirit that we can truly love to the depth and lengths that might be required of us. And when we ponder His love for us we can get a glimpse of the true meaning of love. A Fruit of the Spirit implies a long standing connection. Before there is any fruit, there must be a root. As you are contemplating the upcoming garden season, let’s let the Holy Spirit awaken us to the seeds, roots, and fruits that will reflect our Heavenly Father. Letting His seeds take root so we can share His fruit!